Standard - $263.99 Only 2 left! 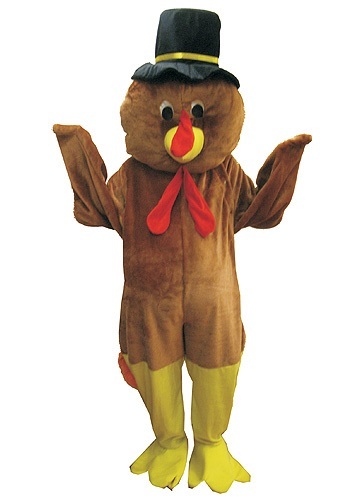 What better way to celebrate turkey than to honor this delicious, succulent bird with a mascot costume? The honorable turkey was a suggestion for America's national bird during the founding of our country. Might as well honor the tastiest runner up with a holiday. When you show up to Thanksgiving this year give Auntie May something to dish about when she gets back to her cul-da-sac, other than cousin Trevor's poor grades. Sure, maybe you didn't get a spot in the Macy's parade this year. You just have to prove your pep this holiday and we're sure you'll get a call next year. By that time you'll be a well seasoned mascot. We do recommend you take off the turkey head and resume your human form before digging in to this year's meal. A forkful of green bean casserole to this guy's beak will just end up in avoidable dry cleaning. A forkful of turkey, however, is much more dangerous. It may end up in mad turkey disease, and no one wants to hang around a grumpy turkey. You'll be comfy in the super soft breathable interior and people might have a hard time keeping their greasy paws off of the soft fur-like exterior. This jumpsuit is easy to move around in, with plenty of room for the arms and legs. So your birdie antics are free to soar to the highest level. Not that flying has ever been the turkey's greatest talent. Whether you're using this Halloween as a way to pump people up for your favorite autumnal holiday or you're delighting your family and friends at a Thanksgiving celebration, your costume is certainly something to gobble about!